Last week I commented on five of the Oscar nominated movies. Now to the remaining four in a season that took flight only toward the end of the year. All nine will be widely available in local theaters until the Academy Awards are broadcast on March 4th. 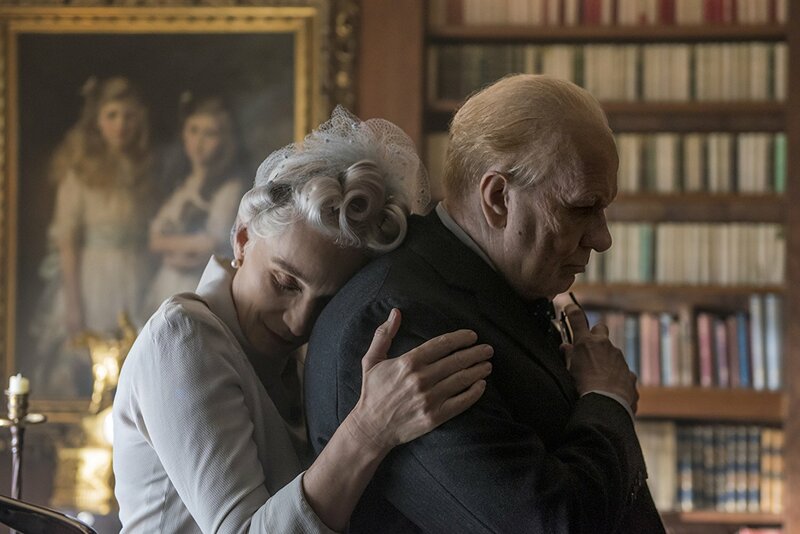 Darkest Hour is a fine portrait of the rise of Winston Churchill in 1940 when England faced imminent attack on their own country after the fall of Europe. As England stood alone against Germany, Churchill rose to the demands of leader of a nation the world thought was about to fall. Gary Oldman is superb as Churchill. Because makeup artists managed to create such a credible likeness, he becomes Churchill and we sink quickly into the thoroughly grim story. This is an absorbing way to sink into the reality of the impending loss faced by Britain and Europe. Gary Oldman is certainly a front runner for Best Actor this year. Get Out is Jordan Poole’s slashing of the shallow understanding white people have of black culture. It is his command that white liberals face the truth that their level of acceptance is shallow, phony, and late. He knew we wouldn’t hear his message unless it was tough. He creates a family of white simpletons who show us that they are no more shallow than those of us who think we understand. It’s a command that we look inward about a historical disgrace. This is a long overdue, important attack on those of us who didn’t understand how much we don’t know. Dunkirk pays tribute to the men who died and to those who rallied to save the allied forces trapped on the beaches of Dunkirk in 1940. Christopher Nolan has captured the reality of the impending disaster. The water ahead and the sky above were full of Nazi soldiers, sailors, and pilots bent on slaughter. And then came the small boats. See Dunkirk and Darkest Hour for a renewed appreciation of the detail and depth of World War II. You will never forget the sounds of inevitability. Phantom Thread is a perfect example of Daniel Day Lewis’s devotion to perfection. You may well love this movie that is made in such exacting, telling detail or you may be angry at a character so thoroughly absorbed in himself. As a designer of dresses that he invents not for sale as much as to create what’s going on in his head, he is absorbed every second in minute detail – each button, each thread. And when he eats out with his new lover or sister, the slight noise of a clinking ice cube sends him into a tantrum. Fastidious? Weird? Whatever this actor chooses to do, he does it perfectly. All are creative in thought and beautifully acted. Five equally deserving actresses and at least five movies. Here’s the challenge: If you love movies, see as many of these nine as you possibly can before they disappear. Every one is an original. This review was posted on February 17, 2018, in Uncategorized. Bookmark the permalink.